This bronze sculpture is well known for the fine detail of the animals' textures — in this case the feathers of the eagles and the woolly coat of the goat. 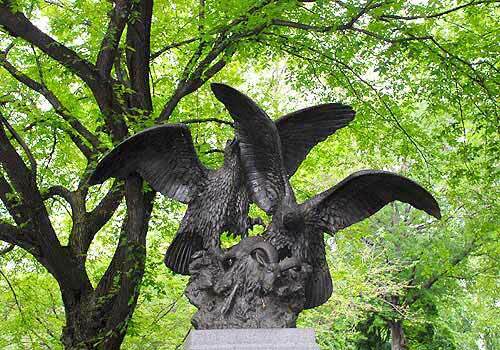 Eagles and Prey, was created by Christophe Fratin and is the oldest known sculpture in any New York City park. Cast in Paris in 1850, the statue was a gift given to the City by Gordon Webster Burnham, and installed in Central Park in 1863. By the 1830s, Fratin became associated with the sculptors known as animaliers, because of their preference for animal subjects. During this time, he produced a series of small bronze pieces that were thought to be fanciful and romantic in tone. Eagles and Prey illustrates the animaliers, interest in the elemental forces of nature: a helpless goat is caught in the talons of two birds of prey. The work's rich surface texture and anatomical detail are typical of Fratin's style. Introduced into Central Park just a year after the park's Board of Commissioners committee formed to review new statuary, Eagles and Prey was considered by some to be an intrusion. Critic Clarence Cook felt that Fratin's choice of subject and "wild, exotic depictions" did not fit in with "the tranquil rural beauty of the park scenery." The sculpture, cleaned and repaired by Central Park Conservancy in 1992, remains an integral member of the group of 19th and early 20th century statues in and around the Mall. Mid-Park at 69th Street west of the Concert Ground.